Grow your own backyard drugstore! The mere scent and sight of these colorful blooms is a proven mood booster - they activate the brain region that regulates hormones reducing anxiety and irritability. 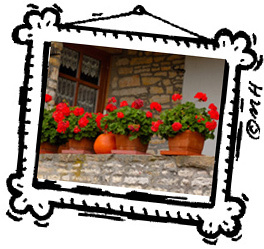 Bonus: Mosquitoes hate the fragrance, so a few geraniums will keep the pests away! Plant a few simple clay pots or fill a garden bed with them. They will never disappoint. 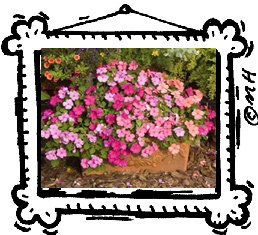 How to grow: Since geraniums are low-maintenance plants that will thrive in nearly any soil, you can place them anywhere - they also need little water to survive. This member of the daisy family may be best known as a relaxing tea, but it also has a compound proven to reduce the appearance of fine lines and wrinkles! Steep 1 tsp of fresh blossoms in 1 C of hot water for 15 -20 minutes, strain and pat on as a facial wash. It also reduces redness and irritation. How to grow: Chamomile is a great ground cover and also does well in garden pots. By placing it in a pot you can control the spreading of roots and keep the plant contained. Just put in sunlight and watch it grow. Soothe sun damage with aloe! You know aloe is great for soothing sunburns - and there's good reason why: The gel inside the leaves has anti-inflammatory compounds that have been found to penetrate skin cells 500% better than water - the reason it cools on contact. The most effective way to benefit: break off a stalk (it'll grow back) and squeeze the gel right onto the burn. 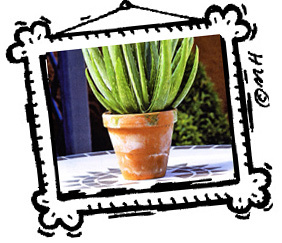 How to grow: Aloe needs watering and warmth, so keep it in a beautiful container and bring it indoors during the winter months. Ease back pain with ground ivy! This vine's potent anti-inflammatory compounds have made it a time-honored remedy for sciatica, lower back pain. To use it fill an old sock with ground ivy, leaves, flowers & roots, hang it on the tub faucet as it fills and soak for 20 minutes. How to grow: It can thrive in any kind of soil or light and needs hardy any effort to survive. However, we recommend you contain it from taking over your yard by placing it in a large decorative container. Relieve poison ivy with impatiens! This colorful annual has an anti-inflammatory agent that counteracts the irritants in poison ivy and poison oak; in fact, its extract can provide itch relief in minutes and overnight rash reduction for 95% of people. Slice the stem and rub the inside on the exposed area, or boil it into a tea and freeze in ice cube trays - whenever you get a rash, rub the ice cube over it. How to grow: Impatiens provide brilliant color in light or even full shade where few flowers can survive. Just make sure you water thoroughly. We love them placed in a simple clay container in your garden area or patio. Zap a rash with chickweed! If it seems like this feathery little plant with tiny white star like flowers is taking over parts of your yard, don't fret. Chickweed has a long history of topical use by the Amish and others to relieve itches, bee stings and bug bites. An now research reveals the reason: It's an effective antihistamine! Slice open the stem and apply directly. How to grow: Chick weed works as excellent ground dover, just place in moist soil in a shady spot and it propagates fast. If you want to hold it back so it won't encroach on other plants, place it in a large decorative container. 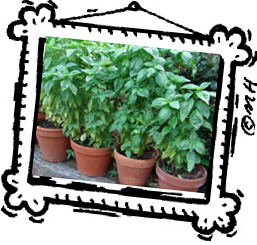 Basil leaves are a natural stimulant, giving you an energy boost whenever you're around them. Sniffing them can even reduce migraines and ease depression, according to scent studies! How to grow: Basil prefers full sun, so keep plants in an area where they'll get eight hours a day. Put them in a kitchen window, in a sweet planter and have them handy year round. Playing with plants, pottery and different combinations of the two can be fun & very rewarding. You can plant different kinds of plants for fragrance & color but don't forget the health and medical purposes they can be used for.